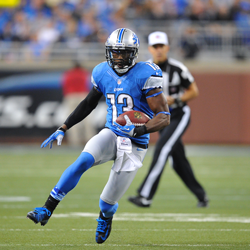 Nate Burleson with the Detroit Lions. The other day I heard that receiver Nate Burleson was one of the Canadians playing in the NFL. Better yet, he was proud of his Canadian heritage and even has a tattoo of the maple leaf on his right leg just above the ankle, proclaiming his pride in being Canadian. So I could not help but wonder, is he Al Burleson’s son? Turns out he is, and it reminded me of a time long ago, when I first started watching football. It was back in the late 1970s that I started watching football. I immediately fell in love with the Calgary Stampeders and particularly their defence. It was full of talented players such as Reggie Lewis, Lyall Woznesensky, and Ed McAleney up front, Bernie Morrison at linebacker, and my favourites – the guys in the secondary. Leading the group was Ray “The Blade” Odums, who played corner with Terry Irvin. The best defensive halfback was Merv Walker and playing rover was…Al Burleson. store similar to Mac's or 7-11. They flourished under coach Jack Gotta, making it to a couple Western Conference Finals, before losing to that dynasty from Edmonton. Gotta was replaced by Ardell Wiegandt, who dismantled that club thoroughly in his short but destructive tenure. He traded Lewis and Walker, and released Burleson. I was enraged. Burleson would catch on with the Los Angeles Express of the United States Football League in 1983 for a year, where he had four interceptions and a quarterback sack, before retiring due to injury. Hugh Campbell, the coach of the Edmonton Eskimos through those five straight Grey Cup championships was the coach for the Express. I imagine Burleson had caught Campbell’s eyes in all those Labour Day bouts. Al Burleson was captain and most valuable player for the Washington Huskies in 1975, his last year of college. The highlight of his season was a 93-yard interception return for a touchdown in the Huskies’ 28-27 win over rival Washington State in the Apple Cup. He went on to play for the Calgary Stampeders from 1976 to 1981. His best seasons were 1978 and 1979 when he had seven and nine interceptions respectively, finishing second in the West in both seasons. 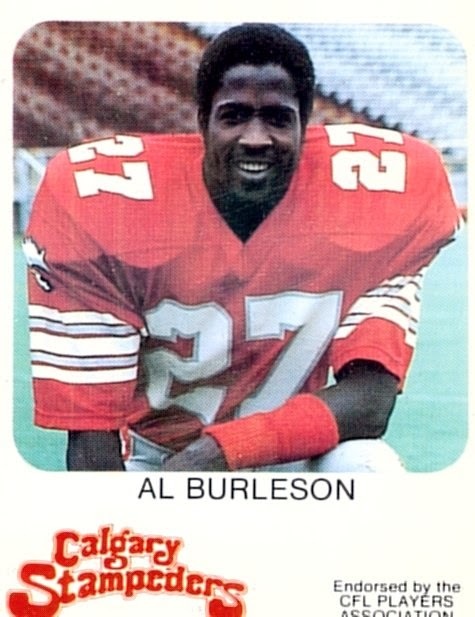 He was named a West all-star in 1978 and 1979, and a CFL all-star in 1979. Al Burleson’s legacy could be measured in interceptions and tackles, but his greatest contribution to football is probably his son Nate. Nate was born in 1981 in Calgary when his dad was playing for the Stampeders. They re-located back to the United States when Al signed with the Express for their inaugural season. Nate ultimately grew up in Seattle, attended the University of Nevada where he played wide receiver, and was selected by the Minnesota Vikings in the 2003 NFL draft. He played there three seasons before moving on to the Seattle Seahawks in 2006. He stayed there until the end of the 2009 season, when he moved on to Detroit as a free agent. He was released after the 2013 season. He was picked up by the Cleveland Browns, released, and as far as I can see is still a free agent. As of the end of the 2013 season, Burleson’s career stats are 457 receptions for 5,630 yards and 39 touchdowns. It’s always interesting to see how deeply attached to our roots we are. According to this article www.canada.com/story_print.html?id=52407be8-77fa-4467-818c-f601b6742d6c&sponsor=, Nate Burleson is immensely proud of his Canadian heritage. He even said if there was ever any sort of World Cup of football, he’d suit up for Canada. Given the Canadian Football League’s requirement that each team have a certain number of Canadian players, the fact Nate Burleson is considered a non-import (that is Canadian), and the fact he’s a free agent, it would be so cool if Nate Burleson wound up his career in the CFL, and even better if it was the Stampeders. Then the circle would be complete.